You are currently browsing the archives for the Judicial Activism category. Tonight, President Trump will announce who he’s nominating to replace Justice Anthony M. Kennedy on the Supreme Court. The list of 25 judges represents the best of the best of conservative jurisprudence. It’s important to note that that isn’t the same as conservative political thinking. The two things are quite different. Conservative political thinking is rooted in the philosophy of limited government being the best form of governing and that the government closest to the people is the best form of governance. These play out in the form of reform-minded policies. Conservative jurisprudential thinking is rooted in the notion that the text points the direction to the ruling. The judiciary’s ruling undoubtedly has a political impact because their rulings are on political documents, aka legislation/statutes. That isn’t the same as judicial activism. For instance, when the Supreme Court ruled on Janus v. AFSCME, they ruled on whether public employee unions violated the employees’ First Amendment rights. The majority didn’t address the policy issue of whether they thought unions were a good or bad thing. That’s a policy matter, which is left to the political branches, aka the executive and legislative branches. 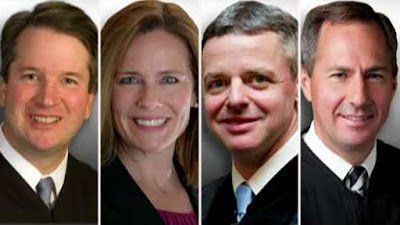 The 4 judges that are thought to be the finalists, Amy Coney-Barrett, Brett Cavanaugh, Raymond Kethledge and Thomas Hardiman, aren’t automatically political conservatives. Each fits the mold of being a judicial conservative, though. The question for President Trump is whether he wants to pick a legal All Star or whether he wants to pick a likely legal Hall of Famer. Cavanaugh’s reputation is that of a man whose opinions are occasionally conciliatory but always filled with conservative logic. He has 12 years of opinions so his track record is fairly lengthy. Amy Coney-Barrett has the reputation of having a conservative judicial mindset but she’s only been on the bench for a year. President Trump might think that he doesn’t want to take a chance on her until she has a more substantive bunch of opinions. She might be an all star. She might be a Hall of Famer. There’s no sense in taking chances at this point. Hardiman and Kethledge both have extensive records in terms of opinions. Earlier today on Fox, Andy McCarthy said that Kethledge’s opinions were like a punch in the nose, meaning that they’re well-reasoned and hard-hitting. That’s the type that’s most likely to turn into a Hall of Famer. I haven’t heard much about Hardiman’s writings except to say that they’re extensive and well-written. Hardiman was supposedly the runner-up to Gorsuch last time so that might give him an edge with President Trump. Whoever President Trump picks, we’ll get a judge who won’t insert his/her policy preferences over the preference of the Legislative and Executive branches. The only question left is whether we get a Hall of Famer or an All Star. That’s from the Court’s ruling. The question now is whether the Court will enforce the principles it stated in its rulings. If they don’t, I’ll know that they’re just DFL politicians in black robes. I’ll know that they aren’t jurists making rulings based on the Constitution. I’ll know that they’re politicians first. The Office of the Revisor of Statutes is also funded through the LCC and they work year-round with state agencies on rule making authority. The Revisor’s office would also be necessary to draft a bill to restore legislative functions once session begins in February. It’s time for the Supreme Court to issue a ruling. Their spineless dithering put the state in this mess. It’s time they stopped their dithering and did their jobs as jurists. Supreme Court vs. the people? During oral arguments, Chief Justice Gildea cut right to the heart of matter by asking this question of Dayton’s lawyer: If the line-item veto power has no limits or qualification, is the governor not empowered to veto or threaten to veto funding for the judicial branch if he doesn’t like the way a court rules a case? This is the tell-tale question. For Dayton’s view to prevail, it must be admitted that the line-item veto has no limits. It means that the governor can threaten to veto funding to operate the legislature or the courts to leverage political outcomes. In short, it means that the governor can threaten the integrity of the courts and the legislature. Scott is right. Gov. Dayton has successfully stacked the Court. If Gov. Dayton’s appointees rule in his favor, Republicans will use that ruling to eviscerate DFL candidates at all levels. Imagine if you’re Dan Wolgamott, running against Jim Knoblach in HD-14B. Further, imagine having to defend the governor from your party essentially claiming that he should have the ability to negotiate in bad faith and get everything he wants from the legislature and the courts through the stroke of a pen. That isn’t what a constitutional republic looks like. It’s what a third-world dictatorship looks like. It’s what totalitarianism looks like. If Gov. Dayton’s appointees rule in his favor, that’ll be proof that Gov. Dayton’s appointees are Democrats first and constitution-minded jurists second. Minnesotans need to ask themselves if that’s what they want. Do they really want Democrats anywhere near the levers of power in St. Paul? It isn’t a stretch to think that Gov. Dayton’s appointees to the Minnesota Supreme Court ran interference for him today. 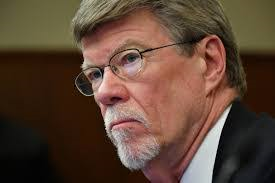 Though MPR’s article on this morning’s oral arguments doesn’t highlight it, Justices Lillehaug and Hudson asked some questions of Doug Kelley. Kelley represented the legislature in this matter. Justice Lillehaug and Justice Hudson “pressed Doug Kelley, the attorney for the Legislature, on why legislative leaders adjourned their special session without waiting for Dayton to act on the bills they passed.” That isn’t a constitutional question. That’s a political question. When Kelley tried talking about Dayton’s reason for line-item vetoing the legislature’s biennial budget, Lillehaug insisted that going into a person’s motives were off-limits. In this situation, though, Lillehaug didn’t think asking about the legislature’s adjournment was off-limits. If the legislature’s motives for adjourning were fair game, Gov. Dayton’s motives for his line-item veto should be fair game, too. Gov. Dayton’s reason for vetoing the legislature’s budget is relevant because Gov. Dayton wanted to tip negotiations into his favor. Complicating matters is the fact that the legislature and Gov. Dayton had signed a contract specifying that there wouldn’t be any amendments to any of the bills, that the dollar figures and policy provisions were fixed and the legislative language was read before the contract was signed. In many ways, then, the agreement is a legally binding contract. Gov. Dayton vetoing the legislature’s funding with a line-item veto is breaking that contract. The legislature had agreed to compromise on some of their priorities if Gov. Dayton compromised on some of his priorities. Once the caucus leaders and Gov. Dayton signed that contract, the implication is that signing bills that lived up to the contract was expected as part of that agreement. The biggest worry that the legislature has is that Gov. Dayton’s appointees will side with him out of political loyalty, not because that’s what the Constitution demands. Simply put, the worry is that they’re Democrat operatives first and that ruling on the side of the Constitution is a distant priority. Schumer continued, saying “Under Chief Justice Roberts, the court has deviated from strongly held precedents on campaign finance issues, voting rights, choice, unions, environmental regulations, and many others.” Notice that Sen. Schumer didn’t accuse the Roberts Court of deviating from the text of the Constitution. Sen. Schumer’s biggest concern was that Justice Roberts didn’t follow precedents, which might or might not align with the text of the Constitution. Frankly, precedents might not be worth much. If they’re grounded in the Constitution, then they might be helpful. If they aren’t grounded in the Constitution, precedents should be rejected and/or scrapped immediately. The gospel according to Justice Scalia says that text of the Constitution and the text of the statute being litigated determine the ruling. They’re the principles behind originalism and textualism. It’s worth noting that liberals love precedents and stare decisis when it leads to their preferred political outcome but they rejoiced when the Supreme Court threw out the precedent that led to their ruling on gay marriage. Democrats like Schumer don’t care about precedents as much as they love getting the verdicts that fit with their agenda. Putting things in biblical terms, the difference between basing rulings on the text of the Constitution and basing rulings on precedents is striking. Precedent-based rulings are flimsy like quicksand. Text-based rulings are as sturdy as the firm foundation that they’re built on. Shouldn’t we want to build a judiciary that makes its rulings based on something foundational, not on something flimsy? But whether Republicans agree or not with my evaluation of whichever candidate the president puts forward, they have a constitutional obligation to hold hearings, conduct a full confirmation process, and vote on the nominee based on his or her merits. Sen. Schumer isn’t telling the truth. There’s nothing in the Constitution, in either Article I, which deals with congressional responsibilities, or Article III, which deals with the judicial branch, that requires Congress to act on a president’s judicial nominees. Further, Sen. Schumer voted 26 times during President Bush’s first term to continue filibustering President Bush’s judicial nominees. How is filibustering judicial nominees voting “on the nominee based on his or her merits”? I’d like to thank Sen. Schumer for issuing this statement. It exposes the flimsiness of the liberals’ judicial philosophy. An adverse Supreme Court ruling would throw the ACA into chaos in three dozen states, including huge states like Florida and Texas. The vast majority of beneficiaries in those states would be suddenly unable to afford their premiums (and might even be required to reimburse the government for unlawful subsidies they’ve already spent). Millions of people would drop out of the insurance marketplaces. Premiums would skyrocket for the very sick people who need coverage the most. But that’s where the conservatives’ “victory” would turn into a big political liability for red- and purple-state Republicans. An adverse ruling would create a problem that could be fixed in two ways: With an astonishingly trivial technical corrections bill in Congress, or with Healthcare.gov states setting up their own exchanges. If you’re a Republican senator from a purple Healthcare.gov state—Wisconsin, Pennsylvania, Nevada, North Carolina, Florida, Ohio, and others—you’ll be under tremendous pressure to pass the legislative fix. If you’re a Republican governor in any Healthcare.gov state, many thousands of your constituents will expect you to both pressure Congress to fix the problem, and prepare to launch your own exchange. Conservatives would like to believe that they could just leave something as deeply rooted as Obamacare permanently hobbled, or that they could use the ensuing chaos as leverage, to force Democrats to reopen the books, and perhaps gut the law in other ways. I think they’re miscalculating. Just as government shutdowns and debt default threats don’t create leverage because the public doesn’t support inviting chaos in pursuit of unrelated goals, I don’t think an adverse ruling in Halbig will create leverage for the GOP. I think Beutler isn’t just wrong about the leverage. I think he’s kidding himself if he thinks this puts Republicans in a difficult position. Congress might well change Section 36B as part of a bigger bill that’s sure to include other provisions that Republicans like and that President Obama doesn’t like. For instance, a new bill might include a change to 36B along with a change that eliminates the medical device tax, another change that changes the definition of a Qualified Health Plan, aka QHP, and a change that reduces the penalties for the employer and individual mandates. Employers and families would certainly love a tiny penalty for not obeying the law. Young people would love being able to buy a catatrophic policy with a HSA to cover other expenses. There’s no question that eliminating the medical device tax would make medical device manufacturers happy. At that point, President Obama signs the bill that’s essentially a fresh start that dramatically improves the ACA or he vetoes a popular bill that forces families to pay higher insurance premiums, that doesn’t repeal an unpopular tax and he alienates major parts of his base. In my opinion, that’s ‘Rock meets hard place’ territory for President Obama. The good news is that it’s great news for employers, families and young people. All that’s required is for Republicans to pass a bill that’s filled with popular provisions. Since a majority of people don’t like the bill’s specifics, that shouldn’t be that difficult. The judiciary’s first responsibility is to determine whether a law is constitutional. If it passes that test, the next test is to determine whether the statute gives the executive branch the authority to take action. In this instance, the DC Circuit ruled that the ACA didn’t give the executive branch, in this case the IRS, the authority to change a major provision of the statute. It isn’t radical to think that the executive branch doesn’t have the authority to rewrite specific provisions of existing statutes. If the Supreme Court validates this ruling and if President Obama wants that provision changed, there’s a simple remedy: work with Congress to change that part of the ACA. I brought my handy pocket Constitution with me today just to make the point that this (the fight between Sen. Cruz and Sen. Feinstein) was not a fair fight because Ted Cruz thought that, somehow, he was going to take on Sen. Dianne Feinstein, who began her career in politics facing the bloodshed in San Francisco when she was elevated to become the mayor after the assassinations there. My fourth and final point is that the Constitution should be the touchstone of everything we do. Some have suggested in this hearing that the role of Congress is to pass laws and it’s up to the courts to determine constitutionality. I would point out that every one of us takes an oath to defend the Constitution and that is a fundamental obligation of every member of this body. There has been a suggestion that Heller would allow this regulation. I would point out that I am not unfamiliar with the Heller case. Indeed, I represented 31 states before the Supreme Court in the Heller case. So I have an intimate familiarity with that case, having been an active part in litigating and winning it 5-4 before the Supreme Court. And what the Supreme Court said in Heller — it did say there are some restrictions on the Second Amendment that are permissable. For example, it specifically identified the current ban on fully automatic machine guns. But it also said that weapons that are in common use, such as, in that case handguns were the principle issue being discussed, and the same arguments that are being suggested about why assault weapons could be banned were made by the District of Columbia in Heller why handguns could be banned. The Supreme Court said “No, if they’re in common use for self defense, they cannot be banned consistent with the Second Amendment.” We have heard testimony that there are some 4,000,000 weapons that would be covered by this legislation. I would suggest that, by any measure, 4,000,000 weapons qualifies as common use. So, under the terms in Heller, they can not be constitutionally prohibited. Mitchell’s argument is based totally on the logic that Sen. Feinstein has been in DC a long time. She’s the chair of the Senate Judiciary Committee. Therefore, she wins the fight. Sen. Cruz’s argument is based on the Supreme Court’s ruling in Heller, which dealt with Washington, DC’s ban on handguns. In that case, the Supreme Court ruled DC’s handgun ban unconstitutional because it infringes on people’s right to defend themselves and their families. That’s consistent with the plain language of the Second Amendment. If Ms. Mitchell wants to argue against SCOTUS’ ruling in Heller, she has to argue against the plain language of the Second Amendment. That’s an uphill fight at best. Sen. Feinstein’s argument, if it can even be classified as such, isn’t based on the Constitution. It’s based on the time-tested liberal axiom of “Surely, we must do something.” That axiom isn’t rooted in thinking things through. It’s based on emotion, which is basing policy on the shakiest of grounds. Ms. Mitchell is right in the sense that this wasn’t a fair fight. Sen. Feinstein was overmatched by the freshman Republican who knew substantially more about the Constitution and the Bill of Rights than the chair of the Senate Judiciary Committee. It’s pretty embarrassing when a freshman schools a committee chair on the chair’s supposed area of expertise. That’s what happened, though. That’s because Sen. Feinstein didn’t think about the rights protected by the Constitution. Conversely, Sen. Cruz had an intimate and thorough understanding of the Bill of Rights and the Supreme Court’s Heller ruling. What’s most delightful is that the best is yet to come. Sen. Feinstein’s bill doesn’t stand a fighting chance in the Senate. I’d bet that Republicans won’t filibuster Sen. Feinstein’s bill because they’ll want vulnerable Democrats to vote on Sen. Feinstein’s bill. Too many partisan politicians are (again) being allowed to frame a key part of federal health care reform in a misleading, even irrelevant ideological perspective. These folks proclaim the U.S. Supreme Court’s mandate to carry health insurance is an erosion of our personal freedoms. Then they couple it with a dead-end conversation about whether it’s a tax or fine on all people. It’s not all people; just those who don’t choose (but can afford) insurance. President Obama has gotten into the habit of calling people freeloaders if they’ll be affected by the individual mandate. That’s a disgusting, dishonest characterization. Since when has the government had the authority to tell car owners that their car insurance had to have specific coverages? Here’s a little dose of reality. The government doesn’t have the authority to tell people that they have to buy a policy that includes collision, theft, fire, liability and comprehensive coverages. Yet that’s exactly what the individual mandate does. It says that people who don’t buy the health insurance policy that the government dictates will pay the individual mandate tax. Imagine this: as a result of the Affordable Care Act, a couple that bought a high-deductible policy, then pays for routine checkups and doctor visits, is subject to the individual mandate tax because their policy didn’t meet the federal government’s minimum coverages. In other words, people that did the right thing in buying their own health insurance are a) being called freeloaders by President Obama and b) subject to a hefty tax because they didn’t do exactly what President Obama dictated to them to do. an absolute ruler, especially a monarch who holds and exercises the powers of government as by inherent right, not subject to restrictions. a person invested with or claiming to exercise absolute authority. a person who behaves in an authoritarian manner; a domineering person. These folks proclaim the U.S. Supreme Court’s mandate to carry health insurance is an erosion of our personal freedoms. First, the Supreme Court’s ruling carries with it an erosion of each person’s liberty. If people want to argue that we’re burdened whether we purchase the health insurance the government tells us to purchase or pay a massive tax, that’s an intellectually honest argument. It’s disgusting but it’s intellectually honest. Second, who appointed the Supreme Court to be the arbiters of personal liberties? They have the right to tell us if something’s constitutional. They don’t have the authority to ignore the Constitution even when an administration attempts to ignore it. If your core objection is all about choice vs. force, you really only have to answer two questions before you propose your alternative plan. First, if people are allowed to choose no insurance, how are they going to pay their medical bills, especially when those bills exceed their savings account? Will they turn over their cars, homes and even assets of other relatives to pay bills? And when that’s not enough (which it won’t be in many cases), how will they cover the remainder? Last I checked, indentured servitude wasn’t exactly legal, which brings us to paying the ultimate price, shall we say, human foreclosure? The first question doesn’t think about liberty because it accepts a faulty premise. It’s bad enough when government tells people they have to buy health insurance. It’s worse when government tells people that that health insurance policy is subject to a massive tax if it doesn’t include the coverages that they insist people buy. Minnesota state statutes include 68 mandates for health insurance, each one adding costs to the insurance policy. If government didn’t initially impose 68 mandates to be included in each health insurance policy, more people would buy health insurance because it wouldn’t be too expensive. If people were allowed to buy high-deductible policies that included coverage for catastrophic health events, the premise for the first question disintegrates. Ditto with the second, sarcastic argument. The problem with this type of editorial is that it deals with what is rather than what should be. Saying that we have to comply with a fatally flawed law is technically true as a matter of law. It’s downright stupid to say that we shouldn’t try repealing a law that a) doesn’t contain health care costs, b) doesn’t control increases in health insurance premiums, c) doesn’t give people sensible health insurance options and d) limits people’s freedom. Questions like that probably limit the number of invites I get to dinner parties. But they get to the cold-hearted realities about the “mandated coverage” debate, which many see as the center of this health reform act. It’s disappointing that educated people wouldn’t think this issue through better than this. The Affordable Care Act is a solution at financial gunpoint. It isn’t a solution. It’s a way to bankrupt this nation. It’s disgusting that a government thinks it can impose unconstitutional, stupid laws on people who’ve tried to do the right thing. It’s more disgusting to think that people start from the default positions that a) liberty is a frivolous thing and b) money is more important than liberty. People who are more worried about money than liberty soon won’t have either. In today’s landmark decision, Chief Justice Roberts’s majority opinion was badly wrong from a constitutional standpoint. The vast majority of Americans think that the PPACA is horrible legislation and terrible policy. That isn’t why I’m arguing that Chief Justice Roberts got it wrong. Instead, I’m arguing that Chief Justice Roberts got it wrong because he’s essentially ruled that the courts have the right to rewrite the legislation. In the original draft of the legislation, there was a specific section of the legislation that dealt specifically with taxes. It’s absurd to think that the Chief Justice of the Supreme Court can simply rewrite legislation. That’s what Chief Justice Roberts did. Congress didn’t include the mandate in the section on taxes. People remember President Obama’s interview with George Stephanopoulos where President Obama repeatedly insisted that the mandate wasn’t a tax. Only when it got into the courts did they start calling it a tax. Chief Justice Roberts might make many wonderful rulings during his time as Chief Justice but his legacy will be sullied by this ruling. He didn’t just call balls and strikes this time. Instead, he appropriated for himself the authority to rewrite the PPACA. That’s what activists do. Judicial historians will note that. Most importantly, the American people will be repulsed by the decision, mostly because it kept intact legislation that hurts the American people. Aside for the activist aspects of this ruling, the reality is that this ruling gives employers another major reason to not hire. It gives small businesses with 40-45 employees justification not to hire that fiftieth employee. There are two bits of good news despite this ruling. One tidbit of good news is that other cases are working their way through the system. The other tidbit of good news is that this will motivate voters to defeat the people that initially gave us this job-killing monstrosity. There’s no question that President Obama will get a temporary surge after this ruling. There’s no question, though, that this is a net negative for President Obama because he’s got to defend this terrible legislation the next 4 months.